The solar system became a little more crowded on January 1, 1801. That night, the Sicilian astronomer Giuseppe Piazzi stumbled upon the first asteroid, which he named Ceres after the Roman goddess of agriculture and grain. Now reclassified as a dwarf planet by the International Astronomical Union, Ceres was the first object discovered to be orbiting the Sun between Mars and Jupiter. As is so often the case in astronomy, once the first of something is discovered, the flood gates open. That certainly has been the case with asteroids. The second asteroid, Pallas, was found in 1802, while the third, Juno, was discovered in 1804. By the end of the 19th century, several hundred were known. Surprisingly, even though Ceres is the largest member of the clan at about 600 miles (960 km), it is not the brightest. That honor goes to Vesta, the fourth asteroid discovered. 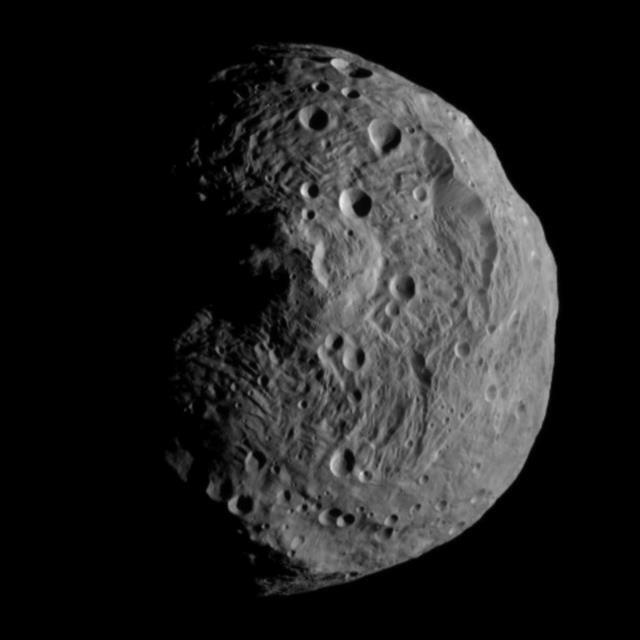 Vesta was first spotted on March 29, 1807, by the German physician Heinrich Olbers. Olbers had also discovered Pallas two years earlier. 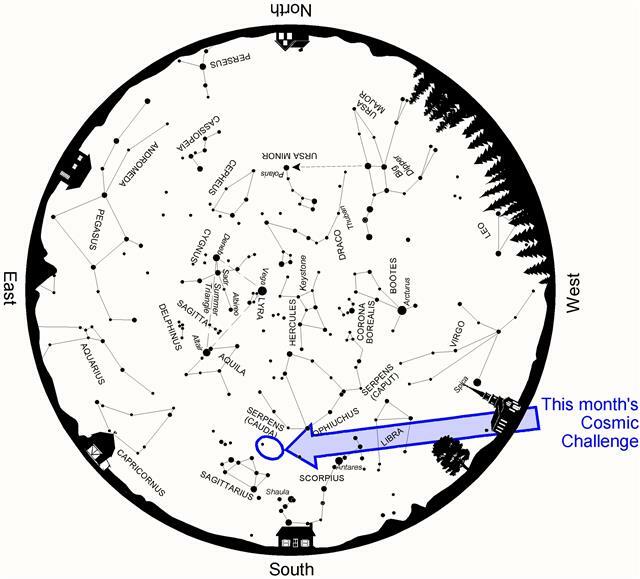 Above: Late night June star map showing the location of this month's Cosmic Challenge. Although oblong Vesta only has an average diameter of about 320 miles (520 km), it can outshine Ceres by more than a full magnitude at times. While Ceres reflects about 10% of the sunlight striking it, Vesta's bright surface reflects more than 30%. Decades ago, it was found that Vesta's surface is apparently covered with basalt, a byproduct of volcanism. This suggested that at some point in the distant past, Vesta was volcanically active. To learn more about both of these fascinating members of our solar system, NASA launched the Dawn spacecraft in September 2007. Dawn's dual destinations made it the first spacecraft to visit two targets in a single mission. It arrived at Vesta in July 2011, where it spent more than a year in orbit. It then fired its ion engine to leave Vesta in September 2012 and move on to Ceres. It went into orbit there in March 2015, where it remains today. These diverse worlds offer scientific snapshots of the birth of our solar system 4.6 billion years ago. Vesta turns out to be more like a mini-planet than like the chunks of rock most think of as asteroids. Dawn's measurements of the gravity field provided good evidence that Vesta's interior is separated into layers, much like Earth did as the planet was forming. Vesta's dense core - apparently once molten, but now solidified - is composed principally of iron and nickel, just like Earth's. Estimates place it at 125 to 150 miles (200 to 250 kilometers) across. Surrounding that is the mantle, which in turn is covered by the veneer of the crust, about 12 miles (20 kilometers) thick. It is now believed that early on Vesta was likely still accumulating material to become a full-fledged planet when Jupiter's immense gravity intervened, putting a stop to that. As a result, when we look at Vesta, many believe that we are seeing a protoplanet frozen in time. Dawn also discovered that Vestas surface is heavily cratered with two huge impact basins near its south pole. The larger, named Rheasilvia, is 310 miles (500 km) wide, while the second, Veneneia, is 250 miles (400 km) wide. Rheasilvia is 95% of the mean diameter of Vesta and it is about 12 miles (19 km) deep. Its central peak rises 12-16 miles (19-26 km) and spans 100 miles (161 km), virtually tying it with Mars' Olympus Mons as the largest mountain in the solar system. Above: The southern hemisphere of Vesta, centered on Rheasilvia's central mountain. Back here on Earth, Vesta has the distinction of being the only asteroid to crack the naked-eye barrier. For one to three weeks either side of opposition, Vesta can be seen without any optical aid provided the sky is clear and dark, and you know exactly where to look. The table below lists future oppositions for the next 7 years. As you can tell from that table, Vesta will be exceptionally bright at this years opposition on June 19, reaching approximately magnitude 5.3. Thats because it passed the perihelion point in its orbit on May 10, only 40 days earlier. Unfortunately, Vesta is also currently passing through Sagittarius, an area so full of faint stars that trying to figure out which one it is will prove quite challenging indeed. 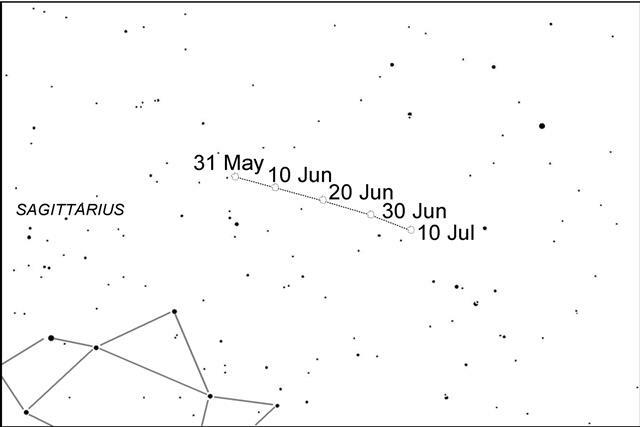 To help you in your quest, the finder chart below plots the path that Vesta will follow this month and next. The chart also shows stars down to approximately 7th magnitude. Id recommend first spotting it through binoculars. Even though there are many stars in the area, Vesta should still be fairly easy to identify. Then, without changing the angle of your gaze, move away from the eyepieces and see if you can spot it by eye alone. It might be easier if the binoculars are mounted on a tripod, so you dont have to keep recentering them on Vesta if you need to try again. Good luck. And be sure to post your results in this columns discussion forum! Oh, and if you want to see where Dawn is now, this month Ceres is in the western sky, passing through the Sickle of Leo. But at a little brighter than 9th magnitude, it will take well-aimed binoculars to spot. You can create your own customized chart by going to TheSkyLive.com's Ceres-Tracker. They also have a Vesta-Tracker that is worth a bookmark. I ought to try this. My neighborhood has a limiting magnitude of 5.5 or so on good nights (rare in summer, but I can dream), so it's within the realm of possibility. 525 km across and ~127.8 million km away is just less than 1 arc second across. Venus is currently 14 arc seconds across, so you'd need about 100x more magnification than what you'd use to view Venus if you want the same view. Am I mathing that right? You should post a picture if you do! This morning before dawn, I had a look at Vesta. It’s very close to M23. M23 is easy to locate, its center is only 38’ from Vesta, easily falling to the same field of view of my eyepiece. Vesta is only 0.6” per SkySafari. My telescope’s resolving power is about 1’. Vesta shows up as a point light source, but a very bright one. Its color is a little yellowish. It’s really standout because it’s really different from its neighboring stars. I had to see it with telescope. The night light in neighbor’s yard is blindingly bright. Thanks for heads up on Vesta . I am not sure if i saw it naked eye, the skies were certainly dark enough, I thought saw it. .. In any event , watching it move from one night to the next as it passed near M23 was quite interesting. So often it seems that I work hard on some faint object while missing something as remarkable as the motion of an asteroid. From home there wasn't much point in trying to see this naked-eye, but the view a few nights ago with a 16" was nice since M23 was close by in the same FOV. The yellow tint of Vesta was prominent. It's an easy object for a 5 to 10 second exposure with a tripod-mounted camera. My 16" has a theoretical resolving power of 0.3". It has a 1/8 wave PV mirror and we have good seeing around here most of the time, so it should be possible. Going to use 720x to attempt to see the disk. Glad for your article, Phil! A bright naked-eye asteroid is always something that adds depth to my mental picture of the solar system (especially with Saturn, Mars, and Jupiter in the same sky)! Its a fairly easy sight for me write now under my dark skies, thought it was pretty hard when it passed close to M23! I observed 4 Vesta again on Monday night from the ASH Naylor Observatory. This time I used 15x70s, a 5" f/5 refractor, and the 17" f/15 classical Cassegrain. As seen through the 17" scope, Vesta displayed a yellowish tint that a fellow ASH member and I noted. While doing a planetary marathon last night from the Naylor Observatory, I observed 4 Vesta once again using 15x70s, a 5" f/5 refractor, and the 17" f/15 classical Cassegrain. The seeing and transparency were mediocre and this time the asteroid's yellow tint was a bit harder to discern.